US Breaker - New Cutler Hammer, GE, Square D Circuit Breaker & Telemecanique LC1 Replacements at a Better Price! Circuit Breaker and Telemecanique replacements. US Breaker specializes in deeply discounted brand new circuit breaker and motor control products for new and replacement needs. We utilize high volume buying group principals, eliminate middle man complexity, and mange overhead allowing thousands of customers to buy a few units at the same price as a few customers buying thousands. Save 72% on US Breakers new circuit breaker and motor control products. Buy a new Cutler Hammer circuit breaker, GE circuit breaker, Siemens ITE circuit breaker,Square D circuit breaker or cross refernce a UL Listed US Breaker replacement for a Telemecanique LC1 contactor, LR2 overload relay or Telemecanique GV2 starter. 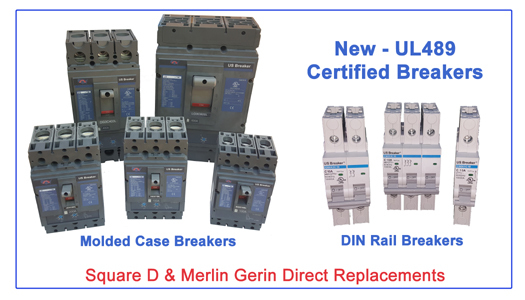 We also cross refence UL listed aftermarket replacements for the Square D Merlin Gerin C60N Multi9 circuit breaker, DP contactor and other Square D Telemecanique products. Our UL Listed electrical replacement products are manufactured by the world's top billion dollar producers according to the ISO9001 Quality Management System, ISO14001 Environmental Management System, and OHSAS Occupational Health and Safety Management System. Our employees bring many years of electrical circuit breaker and motor control experience, at the world's largest manufacturers, offering support and consulting to improve your bottom line. Our goal is to earn your business with fantastic prices, inventory on hand, risk free returns, free same day shipping, market leading products, and flexible payment options. Manufacturers will tell you that a circuit breaker is not designed for repair. Our goal is to offer you a deeply discounted brand new circuit breaker without the risk and uncertainty that normally come in the refurbished circuit breaker business. We are a Distributor that sells only new products featuring the original Cutler Hammer circuit breaker, GE circuit breaker, Square D circuit breaker and US Breaker replacements for Telemecanique motor controls, Square D motor controls, and Merlin Gerin circuit breaker products. Our goal is your 100% satisfaction with a new circuit breaker or Telemecanique contactor & starter replacement! Thank you for shopping with US Breaker!